Gordon pointed out that this trend didn't start with foreclosures, but has been happening over the past decade. The root cause, she said, is economic inequity. But investors, said Weeks of ACCE, are "taking advantage of the crisis to accelerate gentrification." The City of Oakland is about to ramp up its programs to prevent displacement. Since January, the city has been sending canvassers to every home that has a notice of default or foreclosure, in attempts to connect the homeowner to available services. Starting next month, the city will begin a new set of programs to promote stability and affordability, aiming at not only foreclosures, but also vacant homes, said Lin. For homeowners in the foreclosure process, the preferred strategy will be helping them stay in their homes, Lin said. Some will qualify for the ROOT (Restoring Ownership Opportunities Together) program, led by the Community Housing Development Corporation, a Richmond-based nonprofit. The program buys the home from the lender, and then resells it to the homeowner with a restructured mortgage at current market value. 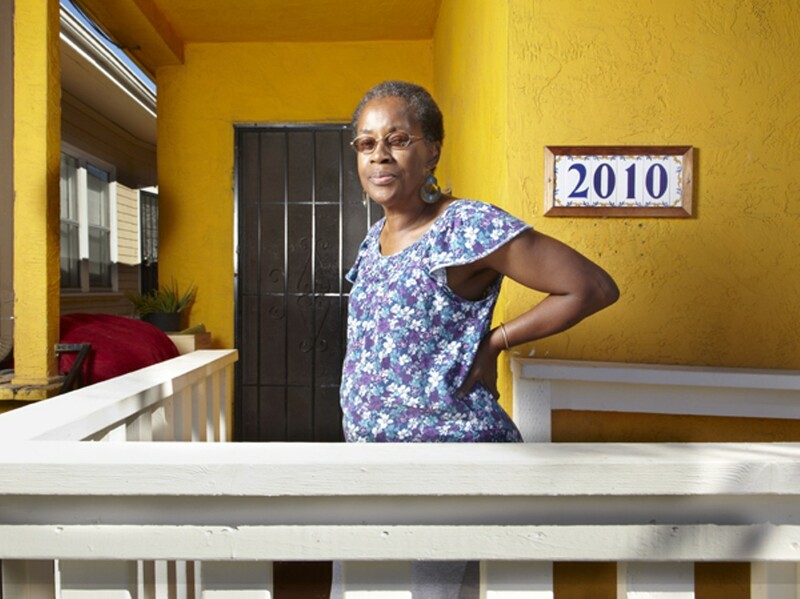 Although Oakland has no immediate plans to copy the City of Richmond's controversial proposal to seize underwater mortgages through eminent domain, the city has other options for homeowners who can no longer afford their mortgage payments. Lin said the city could find an investor willing to rent to the current owner with a long-term lease and affordable rent. Or it might arrange a sale to a new homeowner, through a program that will "develop a pipeline of ready-to-go buyers" pre-approved for mortgages. And if the foreclosed property is currently being rented, Lin said, the city will help the occupant buy the home if possible. Otherwise it will look for a buyer who will make it possible for the tenant to stay. The city will have some cash available to facilitate sales, Lin said, as a result of the settlement of a lawsuit against Wells Fargo by the National Fair Housing Alliance, which charged the bank with "disparate maintenance of foreclosed properties." In addition, nonprofits, including the East Bay Housing Organization and Enterprise Community Partners, will help raise funds for the program. On a smaller scale, some nonprofits are working on other affordable housing programs. The Oakland Community Land Trust is buying and rehabilitating vacant homes in East Oakland and making them "permanently affordable," said Steve King. The Land Trust retains ownership of the land and sells the house to a buyer, who will be able to sell later on, but only at a fixed price. Money from sales will be used to buy more property. "It hasn't reached the scale people had hoped for," said King. "Available capital nowhere near matches what the private sector is bringing to the table." Still, the Land Trust has already bought and rehabbed seventeen properties. Another nonprofit, Enterprise Community Partnership, is working with the East Bay Asian Local Development Corporation and Waypoint Homes on a program to make some of Waypoint's houses affordable to current neighborhood residents. Enterprise spokeswoman Rose Cade said her organization is now "trying to put together the capital" for this project, which will start with twenty homes and eventually hopes to scale up to one hundred. ACCE, meanwhile, is focusing on San Francisco-based REO Homes, which owns and rents out at least 250 homes in West Oakland and has sold other houses it bought there. ACCE's members have been taking a survey of REO tenants, and a sample of responses shows that people who moved in within the past year are paying rents ranging from $2,100 to $2,500. ACCE activist and West Oakland resident Bill Chorneau, who interviewed some of the tenants, said that's substantially higher than the $1,400 to $1,700 that was typical five years ago. Chorneau added that many of the REO Homes tenants were dissatisfied with the condition of the houses, complaining of unvented heaters, mice, flooding, and other problems. Last month about ten ACCE members showed up at the office of Neill Sullivan, whose management company, Sullivan Management, is responsible for REO Homes property. They presented a list of demands, including timely repairs, a commitment to make a certain percentage of the company's homes affordable to lower-income residents, voluntary inclusion of the homes in Oakland's rent control law, and help in expanding homeownership opportunities for local residents. "He said no to everything," Chorneau said, "but he agreed to send out a letter to tenants" encouraging them to report maintenance problems. Through spokespeople, Sullivan and REO Homes declined to comment for this story. Activists, meanwhile, are also beginning to float policy ideas, including expanding rent control to include single-family houses (which are now excluded) when many homes are owned by one company and charging a fee to large housing investors to create a fund for local rent subsidies for low-income families. The need for action will continue, said Lin. "Foreclosed and abandoned properties are an immediate crisis, but also, economic recovery has not lifted everyone's boat," she said. "The jobs are not there for people. We need resources to provide for affordable housing."